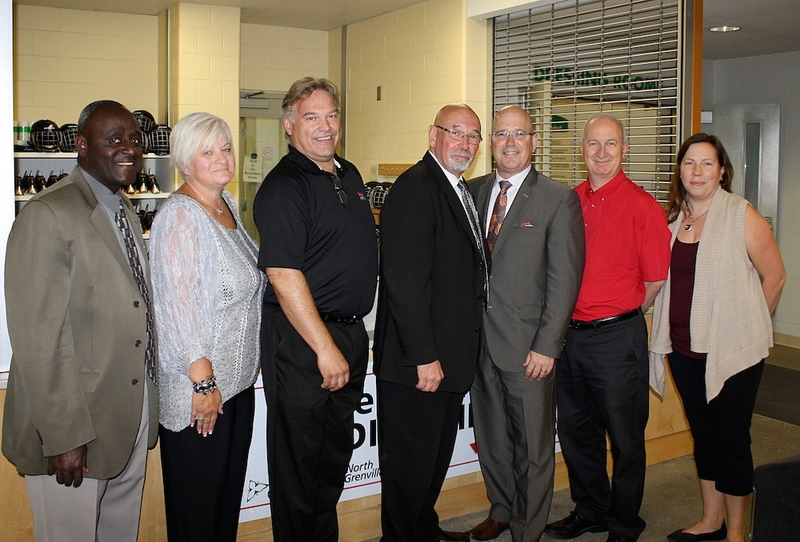 Pictured above: Councillor Frank Onasanya, Deputy Mayor Barb Tobin, Jeff Underhill (Shoeless Joes), Mayor David Gordon, MPP Steve Clark, Frank Hoffman (Canadian Tire Kemptville), and Recreation Coordinator Tammy Hurlbert. With the support of the Ontario Sport and Recreation Communities Fund, and sponsorship from Shoeless Joes, Kemptville Canadian Tire and the First Goal Pro Shop, the Municipality of North Grenville is pleased to offer residents and visitors access to a free Skate and Helmet Lending Library at the North Grenville Municipal Centre. Available during all public skating hours, the lending program functions like a library with all equipment being signed out and signed back in at the arena by a Municipal staff member. Valid photo identification (such as a Drivers’ License, Ontario Health Card or Passport) will be required to borrow equipment. Equipment must not leave the arena or be disassembled in any manner. The Municipal Centre also lends skate aids for those who are still learning to stand on two skates. The goal of the Lending Library is to increase physical activity for all ages, remove barriers to participation and, with the availability of helmets in all sizes, to reinforce the importance of safety and preventing head injuries while on the ice. Donations of gently used skates and hockey helmets are being accepted, as well as monetary donations, to help sustain and expand the Skate and Helmet Lending Library. If you would like to make a donation, please do so during business hours at the Municipal Office, located at the North Grenville Municipal Centre, 285 County Road 44, Kemptville (2nd floor Reception).